If you have noninsured crop disaster assistance or are eligible for other disaster assistance programs, contact the local Farm Service Agency (FSA) office. It is important to do this before starting any cleanup activities so that everything can be documented properly and a waiver can be issued prior to cleanup. If there is crop available to pick and you choose not to, then it will count against the loss. The information provided in this document is not a specific recommendation. Producers should make disaster assistance decisions in consultation with their crop insurance agent, local Farm Service Agency or other government entity responsible for program administration. Silverleaf whitefly (SLWF) adults have been observed in low numbers in cotton. To date very few immature whiteflies have been observed in cotton. We are not aware of any field which has exceeded threshold for SLWF. Most reports include observations of individuals or a few adults when searching plants for corn earworm. However, the presence of SLWF in a field is worth noting and management of all insect pests must consider the presence of SLWF. All efforts should be made to minimize the need to treat SLWF with insecticide. Target spot has been observed throughout South Georgia and is known to cause the most issues in fields with rank growth. Growers with a crop between the first week of bloom and the sixth week of bloom may consider protecting their crop with a fungicide. However, not every grower will benefit from this application and should scout fields prior to making this management decision. This disease is characterized by leaf spots with concentric rings (shown above). Defoliation begins at the lower leaves and progresses up the stalk. Conditions are favorable for the disease and early detection is critical. Once defoliation has reached more that 25% a fungicide application may no longer be feasible. The only negative effect will be altering our digging time, if the field needed to be dug in that time period. We had some peanuts already inverted, but they are drying and will be picked this week. The soil is drying with a few days of sunny weather. There is more damage to younger cotton that will not be known at this time. Right now, you see a lot of reddening of the plant at the top. This is from stress, but multiple factors can cause this stress. We looked a blown over field today where it was obvious whiteflies were not treated. You will also notice stemphyllium leaf spot this time of year with loss of potassium. 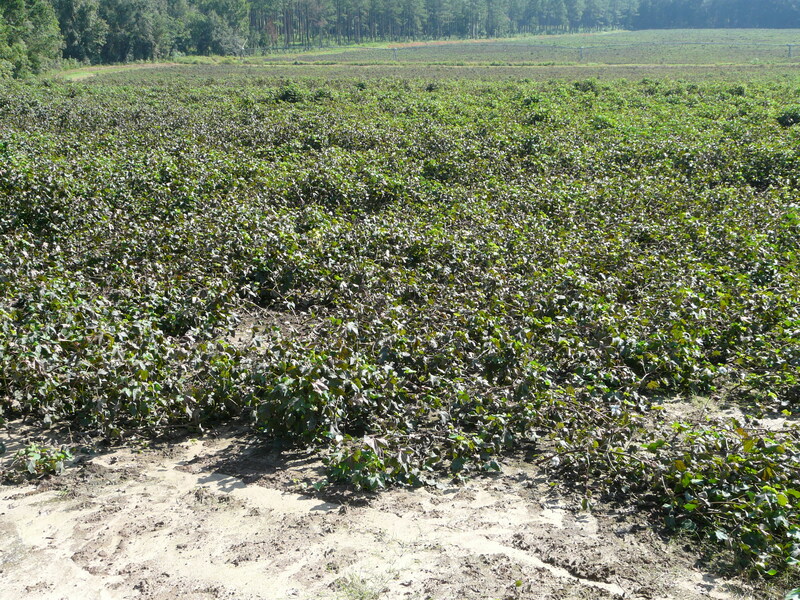 But the wind can also cause this symptom, and will hurt cotton in providing energy to those bolls. UGA Extension Horticulturalist Dr. Lenny Wells’ preliminary estimate is that about 30% of the state’s total pecan crop has been lost. This has become the most damaging wind event ever seen by the Georgia pecan industry. Again, most of the damage east and north of us. In Thomas County, we are a little under that 30% based on what I am seeing. Growers should take photos of their damage and report it to their local FSA office in order to receive financial assistance with cleanup. Cleanup funds normally pay 75% of the USDA-set cost of a mature tree ($300) up to a maximum of $200,000 per entity. Younger trees will be valued at varying levels depending upon age. 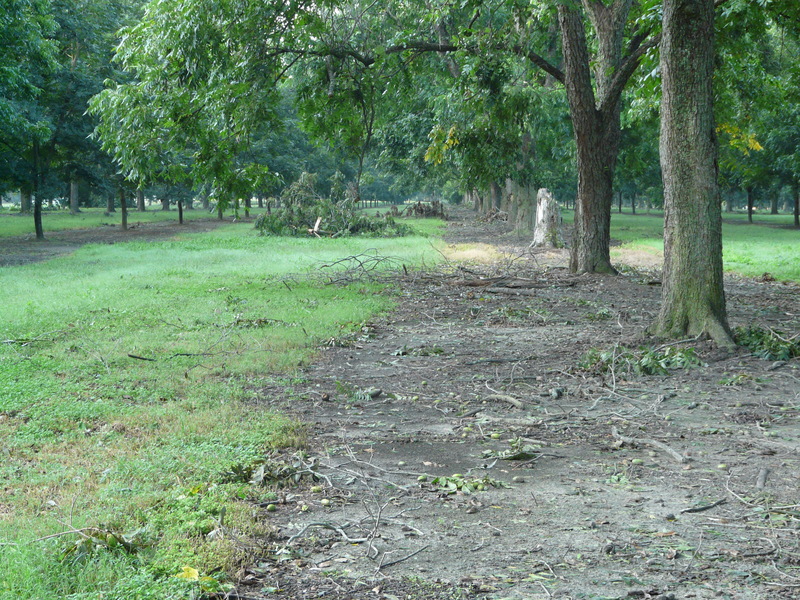 In addition, the Tree Assistance Program (TAP) will pay for tree loss when 15% or more of the orchard is destroyed. This pays 65% of the cost of the tree up to a maximum of $120,000 per entity. This money is not available immediately but your FSA office will gather your report. Requests for cleanup funds are made to Congress and they will then appropriate the funds so it may take a while. 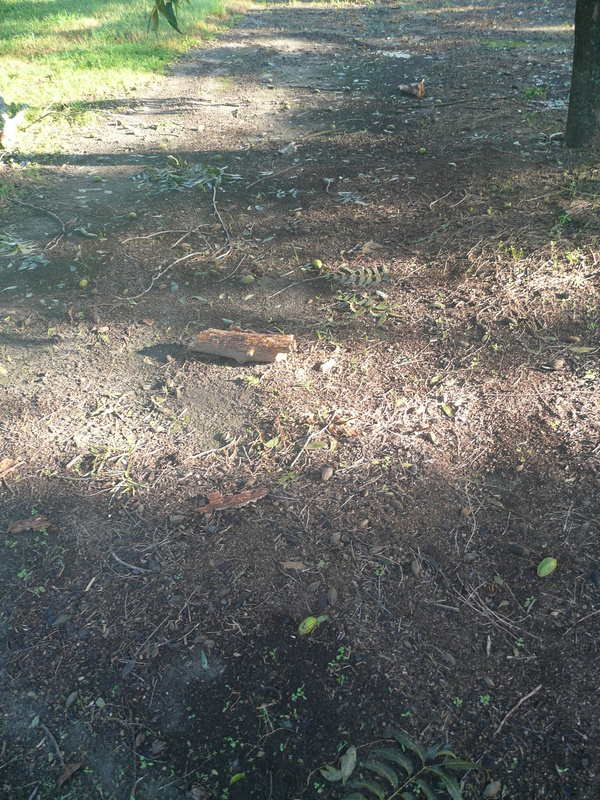 Growers have many questions regarding how to handle fallen trees and the mass of green nuts blown from the trees. The success of righting blown down trees varies considerably with age of the tree. Trees less than 8-10 years old (trunk diameter < about 10 inches) can generally be righted with pretty good success, if leaning less than 45 degrees. Success rate is highly variable when leaning more than 45 degrees. Success of righting these trees will be much greater when trees are pruned back as if they were to be transplanted with a tree spade because the newly-limited root system must be able to support the tree that remains. The larger the tree, the more you should prune off when righting. Uprooted trees or those lying flat on the ground should be removed, especially large, mature trees. Such trees often never perform as they should and will be likely to be blown down again at a later date. Uprooted trees usually exhibit visible broken roots on the side opposite of the direction of fall. The major roots on the opposite side of the tree are also generally broken as well. Such trees usually have much more root damage than is apparent. I’ve had many questions about salvaging the green nuts blown onto the ground and having them de-shucked. In most cases, the expense involved in this will outweigh the benefit. While there are a significant number of nuts on the ground, in most cases, the volume will be less than most growers think. Pawnee shucks were splitting or open and many of these nuts came out of the shuck and are on the ground. Many would have been ready for harvest this week so these nuts can be salvaged once the debris is cleaned up. Early October harvest nuts like Caddo, Oconee, Elliott, Moneymaker etc. may be far enough along to attempt de-shucking if growers are inclined to do so. However, they need to bear in mind the cost of an additional harvest, transport, cleaning, and de-shucking when making this decision. Later varieties like Desirable, Stuart, Cape Fear, Sumner,. etc. are likely not mature enough for de-shucking even though the kernels may be filled out. If the nut does not pop out of the shuck when stepped on or rolled with your foot or if the shell is still white and the markings have not developed growers should not attempt de-shucking. There is potential for further damage to appear at a later date from nuts getting knocked around in the storm. This often bruises or damages the shuck and affects development or maturity of the nut and may lead to stick-tights. However, my early observations are that this bruising is minimal. I do not see a lot of bruising as of yet on the shucks so I am hopeful but it is still a bit early to tell whether or not we will escape this type of damage. 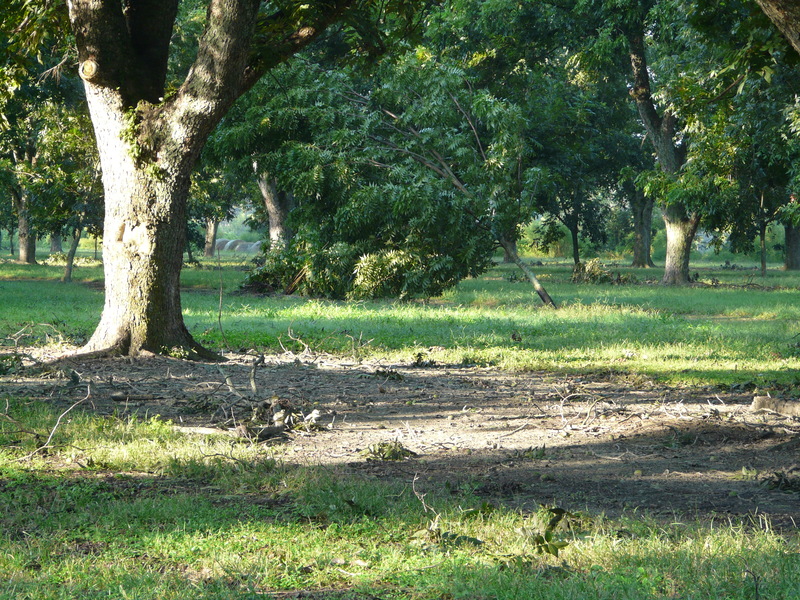 All in all, the Georgia pecan industry has suffered a significant blow but it could have been much worse than it is given the severity of the storm. The current weather is very favorable for development of target spot and also spread of bacterial blight. To date, bacterial blight is only a problem in susceptible varieties…The season is not over yet, and things could change. 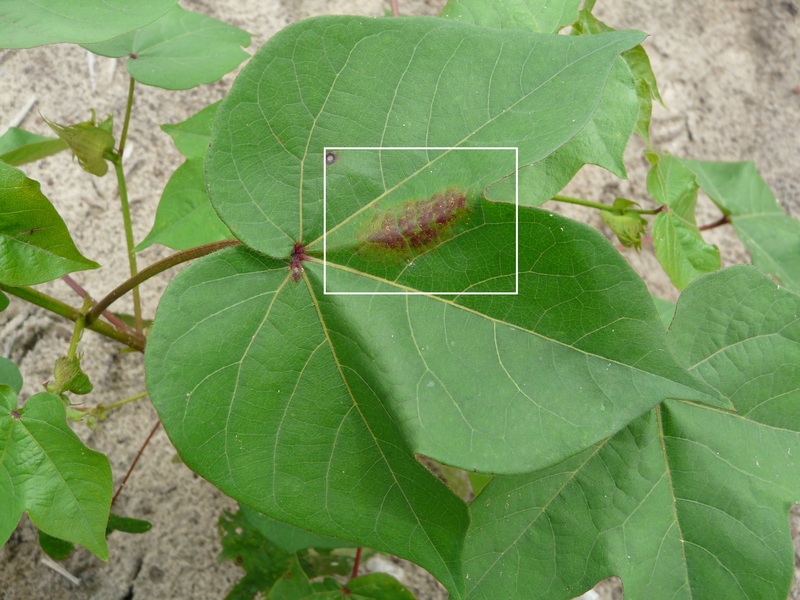 Target Spot seen in ‘rank’, irrigated cotton, but on the very lower leaves. TARGET SPOT: In some, but not all, of your trials target spot is a significant issue. From your trials, some varieties are CLEARLY for susceptible. Conditions we have now are perfect for it. Should every grower spray every field for target spot? NO! But growers SHOULD BE AWARE. In one field, target spot was becoming established, and I told him I would likely treat the field with a fungicide. In another field, no target spot was found and I told him I would not treat that field. We are at a critical point in the peanut season. Reports of white mold in fields are coming in every day and I am receiving some reports of leaf spot. I don’t know of any fields where leaf spot is “out of control” and only one field where white mold is “breaking loose”. However, both diseases can be explosive given the right environment and time to become established. Growers should stay on an appropriate fungicide program for these diseases and also Rhizoctonia limb rot. Timeliness and coverage are CRITICAL. Asian soybean rust has been puzzling this year. We found it in kudzu very early in the season, yet to date it remains confined to kudzu in our southern tier of counties. I still expect soybean rust to “break out” as southern corn rust has done, but I can’t understand what it is doing now. Fortunately, our Sentinel Plots are being monitored, so we can keep you up-to-date. Even though the disease has been slow to develop, I still believe that there is merit, especially in southern Georgia, to protect the soybeans during late-bloom/early pod set, especially when applying something like dimilin and boron. There are other diseases, such as frogeye leaf spot, which can be problematic and that can be managed with the same fungicides at the same time. UGA Entomologists Dr. Phillip Roberts and Dr. Mike Toews put this information together on corn earworms in cotton. During the past week we have received a few reports of escaped corn earworm CEW) larvae in Bt cottons which exceed recommended thresholds. Bt cottons are not immune to CEW and never have been. All Bt cottons should be scouted for CEW and growers should be prepared to react in a timely manner if thresholds are exceeded. We have planted Bt cottons for over 20 years. The technology has moved from a single Bt gene to two gene and now three Bt genes. The addition of Bt genes was for two reasons primarily; 1) to improve efficacy and increase the spectrum of activity and 2) for resistance management. 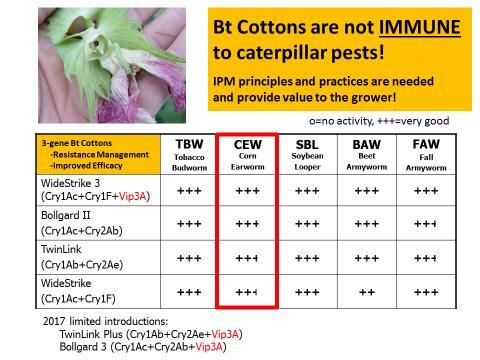 The slide below is a general rating for Bt cottons for various caterpillar pests. Activity on CEW varies by technology, however all technologies should be scouted. Entomologists in Georgia and other areas of the cotton belt believe we are seeing changes in the susceptibility of CEW to some Bt genes. We have been fortunate in Georgia in that only a small percentage of Bt cottons have required treatment for escaped CEW in recent years. However we have observed changes in performance of Bt corn in recent years, i.e. seeing more damage to corn ears. We are also seeing more feeding on squares in Bt cotton which was very rare 5 years ago. One aspect of Bt cotton that we must not forget is that all Bt cottons continue to provide excellent control of tobacco budworm. 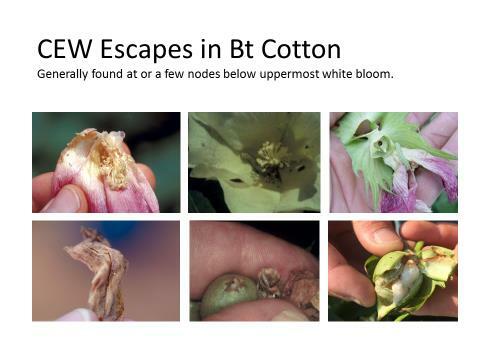 When scouting Bt for CEW cotton scouts should examine the top 12 inches of the plant for eggs and larvae and also examine one bloom, one bloom tagged boll (be sure to look under bloom tag), and an additional boll lower in the canopy. If any damage is observed on the plant the entire plant should be searched. It is important to size larvae as small (< ¼ inch) or large (> ¼ inch). Once larvae reach ¼ inch in length it is likely those larvae will survive on the Bt plant and continue to feed. When we observe escaped CEW larvae they are often associated with fruiting structures near the uppermost white bloom. So make sure you check blooms, bloom tagged bolls, and small bolls closely. The slide below shows various images of CEW in cotton. The threshold for CEW larvae in Bt cotton is when 8 larvae ¼ inch or greater in length are found per 100 plants. When treating escaped CEW in Bt cotton coverage and penetration of the canopy with sprays will be important. We must get the insecticide to the target as larvae will likely be down in the plant canopy. Control of larvae in bolls and under bloom tags will be difficult. Pyrethroids have been the standard treatment for CEW for many years. 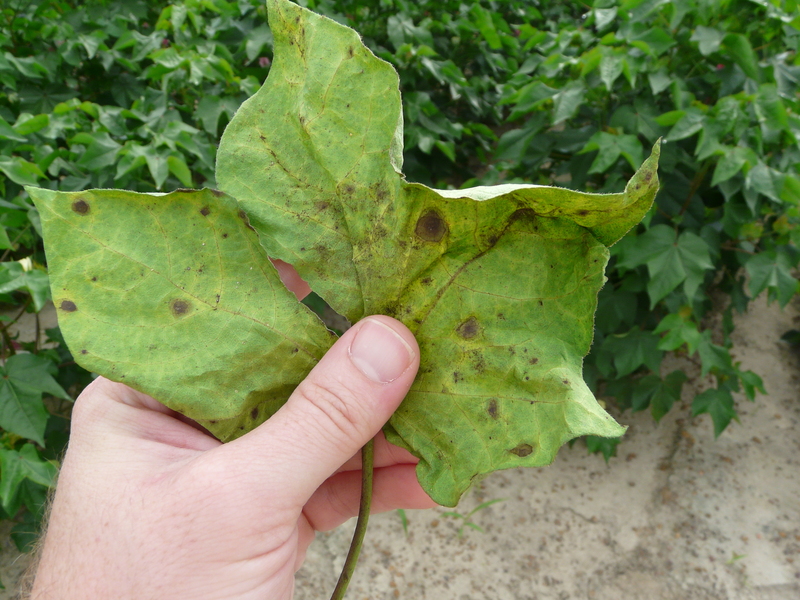 In parts of the cotton belt pyrethroid activity on CEW has deteriorated. For example some states in the Mid-South do not recommend pyrethroids for control of CEW due to pyrethroid resistance and field control failures. We annually monitor CEW susceptibility to pyrethroids in Georgia using adult vial tests. Basically we capture adult CEW moths in pheromone traps and place those in pyrethroid treated vials and monitor survival. During recent years and especially during 2016 we observed increased survival of CEW in these tests which suggests susceptibility is changing. However, we have not observed or been made aware of any field control issues when pyrethroids have been used for CEW control. 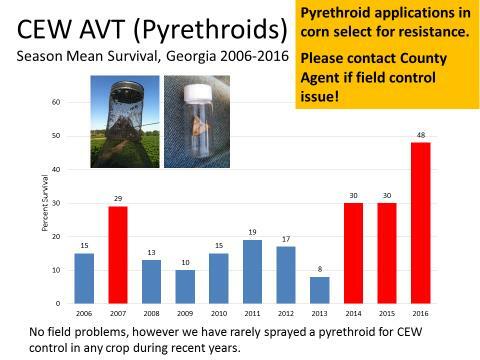 With that said, we have made few field applications of pyrethroids for control of CEW in any crop during recent years. Bottom line is it will be important for us to check behind pyrethroid applications targeting CEW. There are non-pyrethroid alternatives that will provide very good control of CEW. The slide below illustrates CEW survival in pyrethroid treated vials.